Costume heads are fully lined with lycra and can have your choice of many different features which will all be discussed with the customer. These options can include a choice between follow me or 2d eyes, minky or vinyl nose, plush or resin teeth, etc. Partial costumes include a head, tail, hands, and feet. These include the same options as discussed in the head section, as well as other choices for the hands, tail, and feet. These can include a choice between slipper or shoe style feet, padded puffy paws or regular paws, indoor feet or outdoor feet, etc. Armsleeves can also be added. Plantigrade fullsuits include a head, hands, tail, feet, and a plantigrade bodysuit. A plantigrade bodysuit is a bodysuit with no padding, great for mobility and less heat when wearing your costume. Digitigrade / padded fullsuits include a head, hands, tail, feet, and a digitigrade or padded bodysuit. A padded or digitigrade bodysuit is a body that is padded to give the costume a more animal like appearance. Digitigrade legs are done for digitigrade animals, but other types of padding can be done to fit any other animal's body type. These are non padded toony handpaws. Can be four or five fingered, and can include vinyl, fleece, or minky pawpads. Vinyl or resin claws are also an option. These are handpaws that are padded for a more animalistic appearance. These can inclue any of the options listed in the regular handpaw section. They include removable polyfil pockets inside of each finger. These are small tails such as corgi, deer, or a small wolf or fox tail. Pretty much anything that is simple and 12" or smaller. These are medium sized tails that are around 20" or a little longer. These are long tails that are up to 40" or longer. Such as a floor dragger tail. These are sleeves to be worn with a short sleeved shirt. 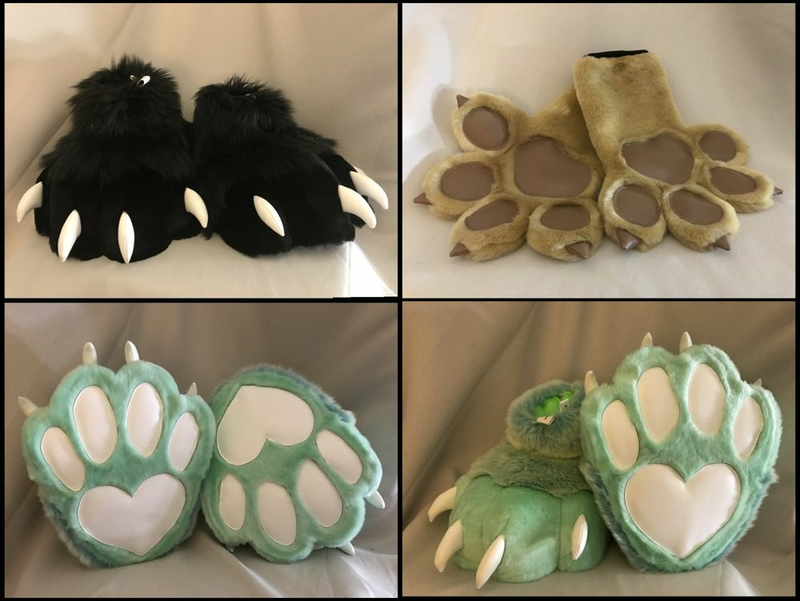 These can include insert your own shoe feetpaws with zippers in the beck, feet with shoes affixed inside, or slipper like paws with a padded insidethat can be worn with socks. These are bodysuits with no padding made custom to your size and design. These are digitigrade or padded bodysuits made custom to your size, design, and padding preferences. Kigurumis are an pajama type costume piece that can be worn to conventions, for fun, or even as pajamas themselves! They are made out of fleece and can have fur accents. These special kigurumis are made to be worn with your fursuit. They feature holes for ears, tail, etc. And are custom sized just for your suit.